Never Yet Melted » Regulate Assault Trucks! 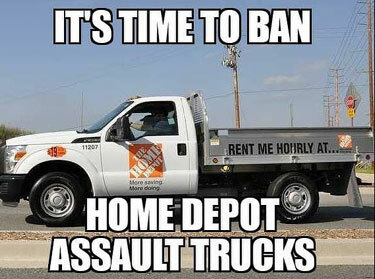 The investigation of the New York terrorist attack will find that the Home Depot rental truck used to conduct the mass killing was equipped with an automatic transmission of the same type found upon military assault vehicles. When will we adopt common sense truck control laws with at least a waiting period and background check for truck rentals? The truck used in NYC to kill eight people was muffled. This is a technology whose only purpose is to prevent people from hearing it coming. Automakers, already with blood on their hands, are now starting to produce almost completely silent electric cars which, at the price of fuel today, serve only the purpose of killing pedestrians silently. How many people will die before we adopt common sense muffler reform? 5 Feedbacks on "Regulate Assault Trucks!" Well of course I agree with your sarcastic point. But the real problem is that almost any Muslim especially an immigrant Muslim is incredibly susceptible to the propaganda of his religion and of terrorists around the world. Who ever set up this diversity visa knew or should have known that this would be the result. I suspect that there are a couple dozen more diversity visa “winners” who will pull off terrorist attacks in the next few months or years. In even in the future sons and daughters of diversity visas will be easily flipped to commit terrorist attacks. Some pundits have said that “home grown” or “lone wolf” terror attacks will be the new normal and go one for a hundred or two hundred years. Why? Because we invited the wolf in. The liberals have often cited the poem on the statue of liberty to justify a massive increases in immigration both legal and illegal. Who knew that the statue of liberty was actually our present day Trojan Horse. What we need to do is put a moratorium on all immigration, legal and illegal. Spend the next few years finding and removing illegal immigrants and revoking visas and green cards and send them home. Then put in the effort to assimilate those immigrants who have become citizens. Make the effort to get all of our citizenns gainfully employed. And finally when all Americans are employed and all immigrants are assimilated and speaking English and actually love America, then and only then we should put the immigration issue to a popular vote. After all we don’t “need” immigrants. We probably already have more people than we can reasonably take care of, educate, feed and employ. We don’t “need” immigration. I think we should end it. It was a good idea when our population was less than 100 million it is not a good idea anymore. Well, we DO need immigration, but it seems to me that it must pass this test: How does this decision benefit the existing citizens of the United States? If you can’t show how it does, why do it? If you needed to hire 20 people at your company, would you apply this criterion? Or would you have a lottery to determine who to hire? Or would you indiscriminately hire the relatives of existing employees? “Need” or want? I can’t think of anything other than terrorists that we get from immigration that we cannot get without it. These trucks are very useful for many businesses like courier services for example USPS.